If you are coping with dry, itchy eyes, you aren’t alone. Millions of Americans suffer from skin and eyelid inflammation that instigates painful ocular conditions like dry eye. Eye drops might provide a temporary solution, but it’s unrealistic to rely on a “bandaid solution” for the rest of your life. 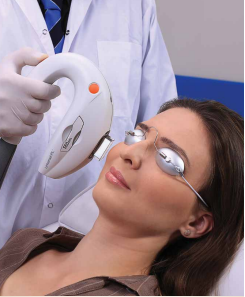 This is why The Eye Clinic of Florida now offers Lumenis Optima IPL treatment, a revolutionary procedure that addresses the root cause of dry, red, itchy, and burning eyes and provides immediate relief. How does the Lumenis Optima IPL Treatment Work? IPL technology uses light pulses to penetrate the tissue of the skin with controlled heat. That heat is directed toward the abnormal blood vessels causing the inflammation that leads to dry, itchy eyes. Once inflammation in the skin and eyelid is eliminated, ocular discomfort immediately disappears. The Lumenis Optima IPL treatment itself is a safe, comfortable, and incredibly quick 15-minute procedure. You will begin your treatment by receiving a gel on your treatment area and protective goggles or pads on your eyes. The entire treatment is painless; the only sensation you might feel is slight warming on your skin. Expect to return every month for up to four sessions to achieve optimal results. Many patients also opt to return annually for a single maintenance treatment that prevents the dry, itchy symptoms from returning. Clinical trials, research, and patient reviews all provide proof that Lumenis Optima IPL treatments provide instant relief from the worst dry eye conditions. It’s truly a revolutionary treatment for skin and eyelid inflammation, so you can expect to feel the results nearly immediately after your procedure. In addition to that relief, you may notice slight redness around your treated areas. This is simply a common and harmless response to the heat of the IPL technology and will disappear in a few hours. There’s virtually no recovery time to worry about, so you can resume normal activities and apply makeup the same day. In only a few treatments, you can say goodbye to painful and damaging dry eye symptoms for good! Call The Eye Clinic of Florida today at 813-779-3338 to learn more and schedule your first appointment.